Take the first step to promote a fit, active community with an Outdoor Step-Up Fitness Station. Step fitness has been around for many years and recently re-emerged growing in popularity because its' diverse, customizable and low impact nature. Each machine has the option of an accompanying Usage and Warning Label with Mounting Post only available in Metallic. It is the buyer′s responsibility to check local ordinances to determine the need for usage and warning label posts in their community. Designed to withstand the elements, the powder-coated, all-steel Step-Up Station energizes the community to engage in fitness activities. 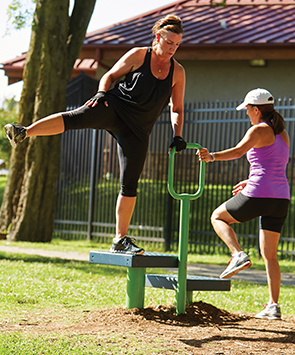 The Step-Up Outdoor Fitness Station provides a variety of age groups and skill levels raised platforms, allowing people to partake in a full body cardio workout without running. 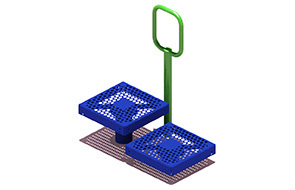 The two differently sized step platforms feature a textured, slip resistant surface design and a connected center support handle, which helps maximize user's safety and experience. The Surgeon General, CDC and ACSM all recommended that one should engage in 20 to 30 minutes of moderate intense cardio activity at least five times a week and doing so increases energy levels, strengthens the heart and lungs, reduce anxiety, stress and risk for heart disease.